Mission San Francisco Solano. Image courtesy Santa Barbara Mission Archive-Library. Mission San Francisco de Solano marks the end of the mission trail. This twenty-first and last mission was founded on July 4, 1823 in what is today the city of Sonoma. When the Franciscan Fathers erected this northern most mission, it culminated three hundred years of Spanish-Mexican settlement in California, which dated back to 1523. Mission San Francisco Solano was the only mission founded after Mexico’s independence from Spain, and the only mission founded without prior approval of the church. 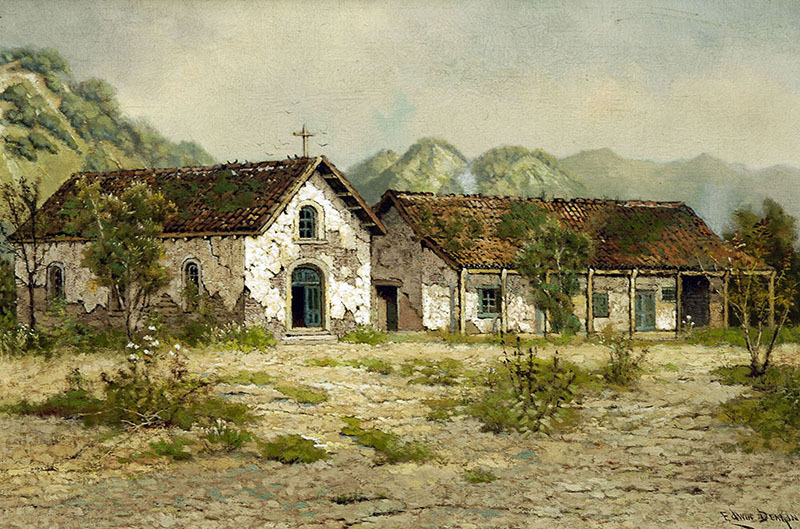 Mission Solano was the brain child of Father José Altimira, who while working at nearby Mission San Francisco de Asís, became discontent and decided to start his own mission. After receiving permission from California Govenor Don Luis Arguello, a plan was created to close Mission San Francisco de Asís and San Rafael, and transfer goods and mission Indians to the new mission complex at Solano. While building Mission Solano, the workers stayed at these wood barracks, waiting for the permanent mission to be built of adobe. Yet, building was temporarily halted by an order from Father Presidente de Sarria as many in the diocese felt the era of the mission was coming to a close. Work was then allowed to be finished on the mission when it was agreed that Mission San Francisco de Asís and Mission San Rafael would not be closed. Mission Solano is located across the street from the Sonoma military barracks, built in 1836 by General Vallejo. It is here where the first bear flag was raised over California on July 14, 1846, proclaiming California a republic while declaring independence from Mexico. The church at Mission Solano was built in 1841 to replace the original structure that had collapsed. A lack of money prevented the Fathers from creating this mission church in the elaborate fashion they were accustom to in Europe. The eye above the altar is referred to as “the eye of heaven”, which the fathers said allowed God to keep a watchful eye on the church. Inside the church is a portrait of this missions patron saint, Francis Solano, a missionary to the Peruvian missions. The earthquake of 1906 destroyed the mission, only to see it restored through the dedicated efforts of groups like The Historic Landmarks League. The legacy of the California missions lives on a Mission Solano as it does at the rest of this historic chain. Located in a State Historic Park. From I-580 : I-580 west/US-101 north. Exit CA-37 towards Vallejo/Napa. Stay straight to CA-116 to Sonoma. The mission is located in the plaza in the center of the town of Sonoma. 10a - 5p daily, closed Thanksgiving, Christmas, and New Year's Day. Please call 707-938-1519 to confirm.